One of the consequences of the pope’s death might be on the career of Gene Greytak. Who is Gene Greytak you might ask, well he is the Catholic actor who has played Pope John Paul II so many times that he even has a set of vestments from the Pope’s tailor Gamarelli. His movie appearances where he played the pope are. "Just the Ten of Us"
"Holy Father, we are in line because you loved us until the last breath." I always thought Patrick Stewart would look the part, and of course he’s a very good actor. That IS remarkable. 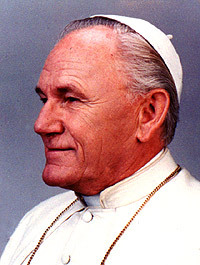 Me, I remember thinking, when JPII was first elected, that Brian Keith would be my choice to play him in the movie. Greytak looks a lot more like him that Albert Finney did.